QSR urges consumers to arm themselves against fry crimes or "frimes"
Food security has come a long way since the hamburglar‘s days of burger snatching. On Monday, McDonald’s Canada launched the “Fry Defender,” a mobile alarm system for french fries. The Fry Defender, built in collaboration with Tribal Toronto and The Konrad Group, is a new feature on McDonald’s Canada’s mobile app, which launched in March. To use the feature, customers simply open the app and place their phone face up on the table next to their fries. They can then “arm” the app when the fries need to be protected, like if they go to the washroom and leave their meal unattended. The app taps the phone’s camera and sensors and when it detects movement sets off a siren and takes rapid photos until it’s disarmed. Hope Bagozzi, senior director creative & digital innovation at McDonald’s Canada, told Marketing the idea for a fry security system came from social listening. “We found that there were both a lot of mentions around loving McDonald’s fries and people stealing them – hence creating the need for Fry Defender,” she said. The Fry Defender is being promoted with a tongue-in-cheek video about the prevalence of fry crimes or “frimes.” In the ad, an actor claims 99% to 100% of Canadians have been, or will be, victims of fry theft in their lifetime. That said, she admitted the campaign is mostly an opportunity for sharable content. 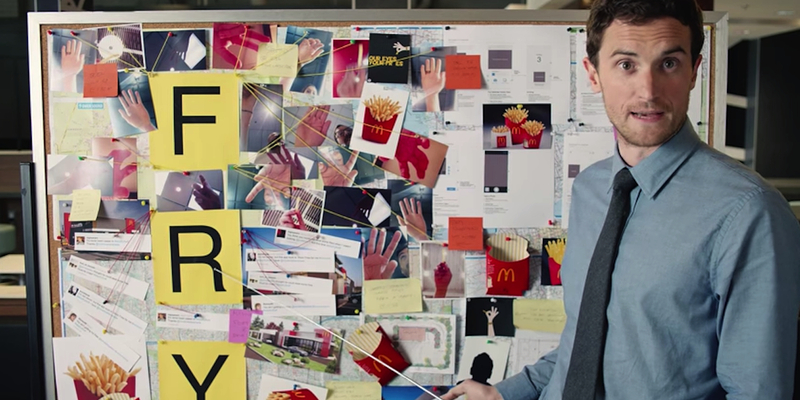 On social and a microsite, McDonald’s will also be sharing posts about the different types of fry thieves and great fry thefts throughout history. The video ad will be promoted via YouTube pre-roll. The Fry Defender will also be promoted via paid media on Facebook, Twitter and Tumblr.